By Scott Gilfoid: WBO light heavyweight champion Nathan Cleverly (23-0, 11 KO’s) says former WBO cruiserweight champion Enzo Maccarinelli (33-5, 26 KO’s) has to earn a shot at his title by proving himself at light heavyweight despite Maccarinelli being the much more proven fighter and having faced much better opposition than Cleverly has fought before. Since Cleverly feels that Maccarinelli needs to prove himself, I think a good way for Maccarinelli to do just that would be for him to face Tony Bellew (16-1, 10 KO’s) next, the guy that Cleverly just beat by a controversial 12 round majority decision last October. I thought Cleverly lost the fight, but I guess that’s how things go sometimes when you got a popular fighter like Cleverly defending his strap. 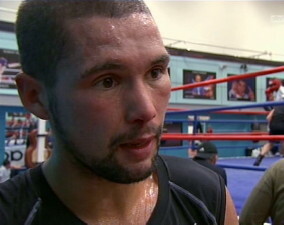 There’s a lot of people thinking Cleverly is the next coming of Joe Calzaghe. Personally, I don’t see it. I think Cleverly is more like the second coming of Darren Barker than anything resembling Calzaghe. But anyway, I think Maccarinelli needs to call out Bellew and try to fight him. A win over Bellew will put Cleverly in a bad position where he would either have to face Maccarinelli and likely get knocked out or just come and say that he’s afraid of the guy. It’ll be pretty clear what the deal is if Cleverly still won’t fight Maccarinelli even after he makes easy work of Bellew, the guy that Cleverly went life and death with. If Maccarinelli is really got a hard on for facing Cleverly then he needs to take a big risk and fight Bellew. If he’s afraid, then Maccarinelli should look elsewhere in the direction of the slow as molasses WBA light heavyweight champion Beibut Shumenov. I can see Maccarinelli beating that guy with no problems, because Shumenov is a pretty average fighter without a lot of power.